Portland Pozzolana Cement, "Product of Future," is prepared by a fully-automated, dry manufacturing process using state of the art technology under strict quality assurance at all stages of manufacturing with the help of the "ROBOTIC (POLAB)" system. PPC is manufactured by inter-grinding well-burnt OPC Clinker with gypsum and pozzolanic materials like power-station fly ash or silicious earths. • Higher durability of concrete structure due to less permeability of water. • More resistance towards the attack of alkalies, sulphates, chlorides, chemicals. • Low heat of hydration. • Due to high fineness, PPC has better cohesion with aggregates and makes more dense concreteness. 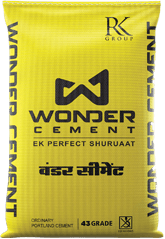 • Comparative lower Water-Cement ratio provides an added advantage for the further increase of compressive strength of the concrete. Ordinary Portland Cement is prepared by a fully-automated, dry manufacturing process using state of the art technology under strict quality assurance at all stages of manufacturing with the help of the "ROBOTIC (POLAB)" system. The product comes in a range of specifications to suit various conditions and applications such as dry-lean mixes, general-purpose ready-mixes and even high strength pre-cast and pre-stressed concrete. OPC is available in OPC-43 Grade & OPC-53 Grade. • Produces highly durable and sound concrete due to very low percentage of alkalis, chlorides, magnesia and free lime in its composition. • Almost negligible chloride content results in restraining corrosion of concrete structure in hostile environments. 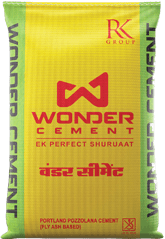 • Significant saving in cement consumption while making concrete of grades M15, M20, M25, M35 and pre-cast segments due to high strength.